Florida Republican gubernatorial candidate Ron DeSantis and Florida Gov. Rick Scott. The competitive election races in Florida have finally been called. 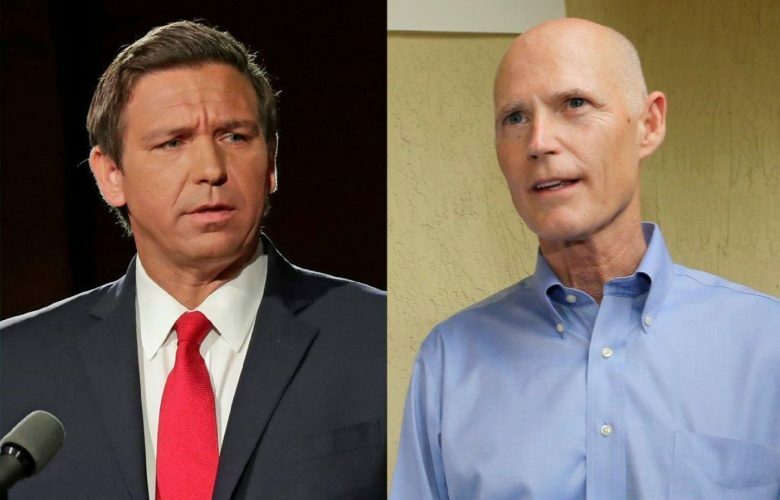 Republican Ron DeSantis will be the next governor of Florida, and outgoing Republican Governor Rick Scott will replace incumbent Democratic Senator Bill Nelson in the U.S. Senate. These results follow a tumultuous series of events beginning election day Nov. 6. On election night, both DeSantis and Scott declared their respective victories by narrow margins and, initially, DeSantis’ opponent, Tallahassee Mayor Andrew Gillum, gave a concession speech. However, as more votes were counted, the margins narrowed further and many ballots remained to be counted in the historically Democratic counties of Palm Beach and Broward, Gillum revoked his concession and joined Senator Nelson in calling for all votes to be counted before making any determination. Following election night with votes still streaming in and both races looking as though they would go to recounts – as dictated by Florida law, lawyers from both parties flooded to the state. In this tense environment, Governor Scott, Sen Marco Rubio (R-FL) and President Trump, alongside other prominent Republicans, all accused Democrats of orchestrating voter fraud. These allegations, made without any evidence being put forward, remain unsubstantiated and seem to stem from the fact that Broward and Palm Beach counties, which are typically Democratic strongholds, lagged behind the rest of the state in providing results. Palm Beach and Broward are the second and third largest counties in the state and did have their results in by the time results were officially required to be in. While accusations of voter fraud are false, it is true there were irregularities in the Florida election. In Broward County, the election supervisor, Brenda Snipes, admitted to errors including allowing a small number of ballots determined uncountable to be mixed with valid ballots. In the Republican stronghold of Bay County, a small number of ballots were accepted by email despite state law prohibiting it and a number of votes were not counted because they were lost at a mailing facility. The ballot design used in Broward County compounded such irregularities. Due to the way the county designed their ballot, the U.S. Senate race was in a place underneath a set of instructions that appears easily overlooked. Indeed, the number of voters who seemed not to have marked the senate race, but voted a straight Democratic ticket otherwise is within the margin Senator Nelson needed to prevail in this narrow race. The intensely competitive environment of Florida elections explains why even small irregularities in Florida become national news. All states face voting problems – Florida’s voting problems are not significantly more egregious than any in other states, but it does receive heightened scrutiny in every election. Florida elections often come down to one point of the electorate or less and the likely voter base is so evenly balanced that even small issues and irregularities have the potential to swing elections – leading to increased national attention. Similar problems in Democrat and Republican strongholds likes California and Utah, respectively, are far less likely to have an impact and receive less attention. What is clear from the 2018 midterms, is that Florida – a state long known for its razor thin margins and contentious elections, most infamously in the presidential election of 2000 – has maintained its status as the perennial swing state. Photo courtesy of John Raoux and Alan Diaz / AP.